Fill a large pot with water, salt well (we used table salt). Bring water to a boil. Pour 1 ½ tablespoons (we used 2 tablespoons) of the oil into a large skillet, setting the heat to medium-high. 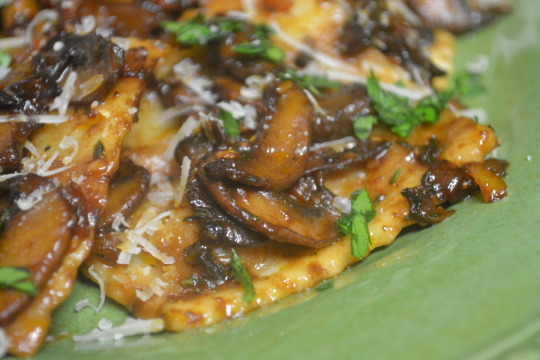 Once the oil’s hot, add in the mushrooms, ¼ teaspoon salt and a few grinds of black pepper, stirring just to combine. Spread the mushrooms out as evenly as you can and let them cook (without stirring them) for 3 minutes or until they look well browned on one side. Stir continuously for another 3 minutes or until browned all over and any liquid has evaporated (if the mushrooms look dry and the skillet begins to scorch, drizzle a little bit of oil into the skillet). 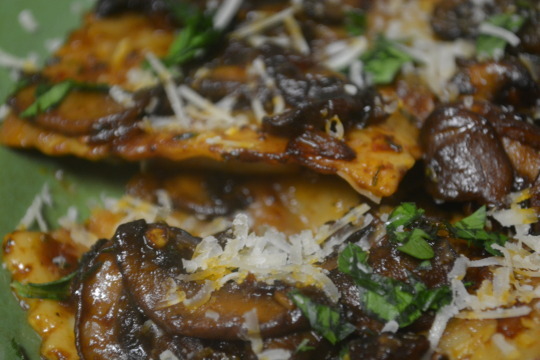 Take the mushrooms out of the skillet and place them on a plate for the time being. Pour another tablespoon of oil into the skillet, setting the heat to medium. Toss the onion in and stir constantly for two minutes or until the onion looks translucent. Throw the garlic in and continue stirring for 30 seconds or until you can smell the garlic. Add in the tomato paste, stirring it around for a minute. Add the mushrooms and any accumulated juice back into the skillet. Now add in the flour, thyme and pepper flakes, stirring frequently for 1 to 2 minutes. Pour the wine in and stir until it looks like it’s thickened, pouring the broth in afterwards and letting the mixture simmer until it’s reduced into a light sauce. Season with salt and pepper to taste. While the sauce is simmering, cook the pasta in that boiling water according to the directions on the package that they came in until they have an al dente texture. Drain and transfer the pasta into the skillet with the mushroom sauce, stirring to coat over low heat (we turned the heat off, knowing we’d have residual heat left). Serve individual portions, topping with cheese and parsley afterwards. Serves 3 to 4 (maybe it’s because we had to use a 9 oz. pkg. that only had 10 ravioli but this only made 2 portions for us). As soon as we took our first bite of this, we knew there wasn’t going to be any leftovers ! The heat was nice at first but near the end it did start to be the predominate flavor so we’ll try a single pinch of pepper flakes next time. The sauce was delicious but felt a little sparse after tossing the ravioli in it so next time we make this (and there will definitely be a next time), we’re going to double the sauce. 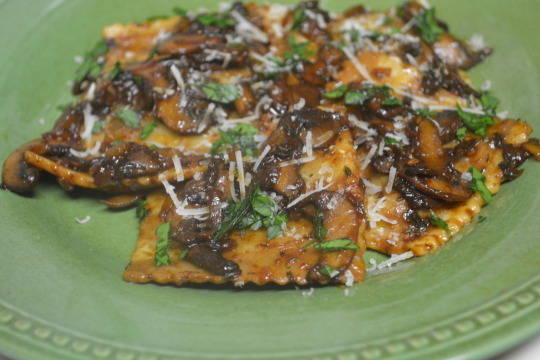 The sauce and ravioli taste great together but adding that Parmigiano-Reggiano took it to the next level of yumminess ! We weren’t paid in any form to promote Colavita or Swanson.